First things first, an obligatory aside: weeping for Russell Westbrook today is, at the very least, a misguided waste of time and, at the very most, a distraction from the ills which plague this country and of which we will be reminded for the better part of the next 4-8 years. Yet, maybe today it’s the distraction we need. Some people blast Hall & Oates and look at endless scrolls of puppy photos; others launch into diatribes about the Kardashians and whether a hot dog is a sandwich. Pick your poison. In most offensive categories, Westbrook is either leading or is second to former teammate and current D’Antonism talisman James Harden. Most people pegged Harden and Westbrook as the Western Conference’s starting back court. Harden, whose Houston Rockets are currently third in the West with a 33-12 record, made it; Steph Curry, two-time defending league MVP and the Red Baron of the three-point shot, took Westbrook’s presumptive slot. A quick primer on how NBA All-Star voting now works, in case you missed Ernie Johnson’s superlative demonstration on Inside the NBA Thursday evening. Rather than simply counting the fan vote, this season the league introduced a weighted system which included media and player votes for the first time. The fan vote counts for 50%, and media and player votes each count for 25%. There is a little more to it than that, especially when getting to tiebreakers – refer to the video linked above – but that is the basic gist. As far as major criticisms go, people attribute many to Westbrook, not all of them unfounded. Brodie catches heat for his exaggerated usage rate, his turnovers, his wild shot selection and his refusal to defer to teammates. While it’s true that he leads the league in usage rate – his 41.9% would shatter Kobe Bryant’s record 38.7%, set in 2005-’06 – Russ also leads the league in assist percentage, at 57.2%, a full 5.2% better than Harden. Westbrook is also second to Harden in both turnovers and turnovers per game, yet Harden’s place in the All-Star starting lineup was never in question. It isn’t that Curry isn’t deserving of a spot, or even of a starting spot. Indeed, the Chef is averaging 24.6 points and 6.1 assists per game on a 62.5% true shooting percentage, numbers that are mind-bogglingly impressive while still being only slightly off the MVP paces of his past two seasons. And yes, Curry’s Golden State Warriors sport the best record in the NBA at 36-6, having already disposed of Westbrook’s seventh-place Thunder twice. Context is always everything, always, but in this case, it becomes especially important. Curry’s Warriors aren’t even really Curry’s Warriors anymore, at least not like they have been in the past few seasons, as he’s ceded plenty of scoring power to Westbrook’s other, former MVP-caliber teammate, Kevin Durant, who was also voted in as a starter for the West. In truth, it may be best that Durant and Westbrook do not share the floor to begin the game. On Wednesday night, for the second time this season, the Golden State Warriors faced the Oklahoma City Thunder, and for the second time, it was a drubbing – a 121-100 Warriors win following a 122-96 Warriors win in November. Durant seemed to personally take out some frustration on his old team, registering his first 40-point game as a Warrior. 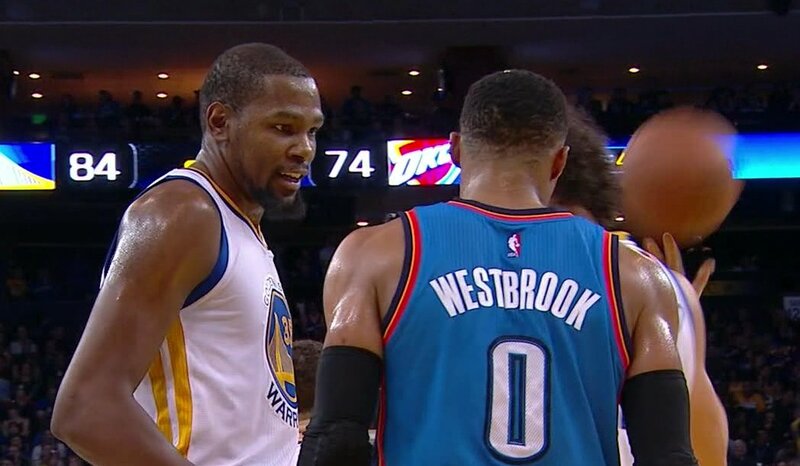 A crucial sequence occurred in the third quarter, when Durant attempted (and failed) a Westbrook-style breakaway dunk, Westbrook dunked (partially on Durant), Durant hit a three, Westbrook notched an egregious walk and Durant crossed Westbrook over before being fouled and then, reportedly for the first time since July, spoke to Westbrook. Neither had anything meaningful to say regarding the interaction, with the latter reiterating that they are not on speaking terms. Westbrook did, however, explicitly vow revenge against Zaza Pachulia for a hard foul. Routinely charging one-on-five isn’t going to win the Thunder a title, and doing it against a team as full of All-Stars as the Warriors is unbelievably crass and sub-optimal. None of us can speak to Westbrook’s personal feelings; he seems interminably focused on each opponent as a decrepit building through which to launch his inflamed wrecking ball. One has to imagine, however, he felt slighted when Durant informed him via text that he was going to Golden State, a team which had only just barely beaten them in the Western Conference Finals. If we are to take things as they are and accept his actions in the place of words, Westbrook, then, is in the midst of a season-long representation of the “K” text message response. Rivers turn to fire, fire becomes ice, ice hardens inside Westbrook’s heart. For all intents and purposes, on any given night, Russell Westbrook is the principal shareholder of NBA fun stock. Adam Silver is the Commissioner, and what he commissions is an increasingly refined art, poetry as hardwood jazz, and Brodie is the man holding the moleskin notebook as well as the lead saxophone. Democracy fails. You can’t please all of the people all of the time, but doing the best you can with what you have at your disposal can make all the difference. Trust in the system, until it breaks so spectacularly that change is inevitable. Though he should be, Russell Westbrook is not a starter for the Western Conference All-Star team. Injustice prevails. 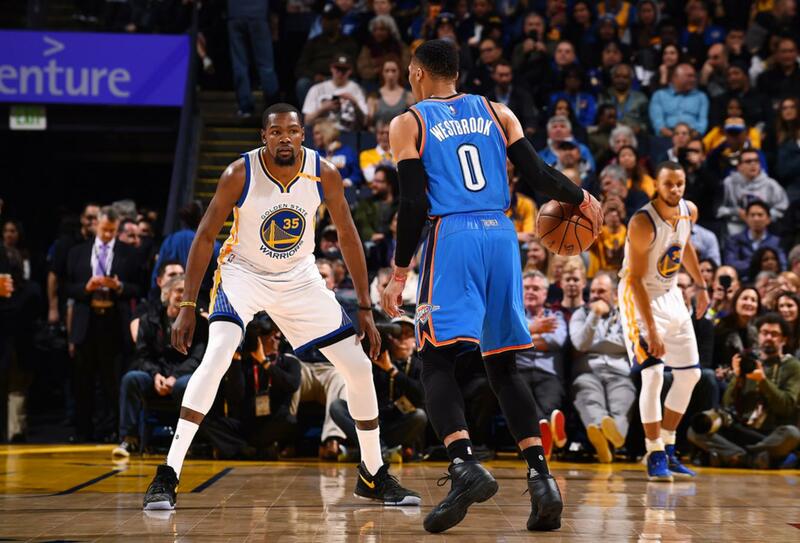 The Thunder next play the Warriors on February 11, about a week before All-Star festivities begin in New Orleans. Trust Westbrook not to have forgotten about his snub, and the players around him to rally, to march, even in the face of futility. Remember: it’s always their fault, not yours. You’re right. You did the good thing. If we’re lucky, honestly, given the new owner of the nuclear football’s remarkable late-night social media output. Just for the record, though, Curry is shooting under 40% from three for the first time in his career. That will likely change, but soak it up now.